Au contraire, j'ai opté pour l'option : chaussures roses poudrées. Ces chaussures j'ai craqué dessus dans le cadre de ma collaboration avec JustFab. Pour la petite histoire, je me suis rendue au showroom pour choisir quelques vêtements et j'ai directement jeté mon dévolu sur cette paire. La forme rappelle un peu celle des chaussures Chanel. L'arrondi devant, le petit talon, le velours et le rose poudré , c'est un peu la tendance de la chaussure actuelle, pas vrai ? 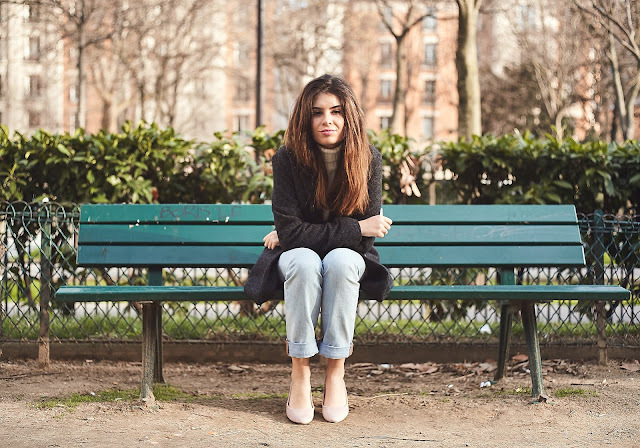 Hâte de lire vos avis sur ce look ! Mom jean, cropped top, boyish coat and pink shoes: it is basically me. Let me explain myself. I usually love to wear basics. White, grey and denim are often my favorites. That's why I love to play on materials, shapes and styles, always keeping a unifying structure. I imagined this outfit as a streetwear one. I dared to mix a hight waist mom jean, a white cropped top and a boyish coat. When I Keep it simple like that, I love to be original. I could have just worn a pair of white sneakers but I prefered to add this pair of pink shoes. For the little story, It was love at first sight with thoses shoes when I forst saw them . Indeed, I was invited to chose my favorite clothes at the JustFab showroom. The shape is quiet like the Chanel iconic shoes one, and love the velvet style and the color. It is the perfect trendy pair of shoes. Can't wait to read your feedback on this look !